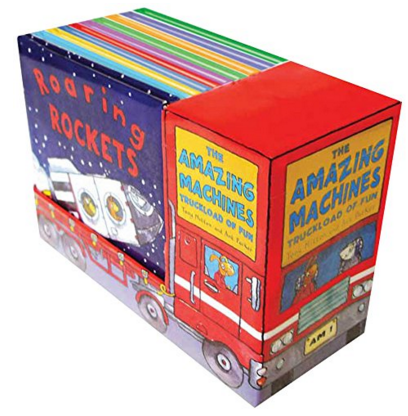 Amazing Machines: Truckload Of Fun (10-Book Set) Just $13 Down From $25! You are here: Home / Great Deals / Amazon Deals / Amazing Machines: Truckload Of Fun (10-Book Set) Just $13 Down From $25! Here’s a great Amazon deal. The Amazing Machines: Truckload Of Fun (10-Book Set) is just $13 down from $25! Get yours now while it lasts! The bestselling Amazing Machines series is now available in a charming box set. With ten mini editions inside, this collection is the perfect gift for any preschooler who loves machines. From airplanes to rockets to tractors, these critically acclaimed picture books are full of fun rhyming text, bright artwork, and wacky animal characters that will engage and delight young children as they learn about machines. Each book includes a helpful illustrated glossary of technical words to help build vocabulary.